As a rebellious teenager, I lived a double life. My family required that I attend church on Sunday’s, even though I despised going. At church, I became masterful at saying and doing the right things. Whenever I was outside the church, however, the real Rick Boxx surfaced. My drinking and carousing would have appalled our church leaders. Many people in the business world also live double lives. They act one way on Sunday mornings, and completely different on Monday’s. For many, their business practices idolize money and power rather than God. Examine your business practices today. Are you serving God’s interests, or your own? 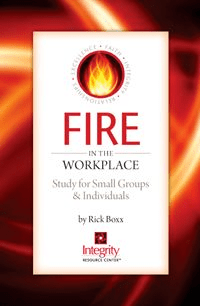 The FIRE in the Workplace study provides six lessons that will help individuals and groups learn and model God's principles at work. The result will be employees and employers who love God, love others, and live out their faith courageously. Purchase here. Originally published April 23, 2013.